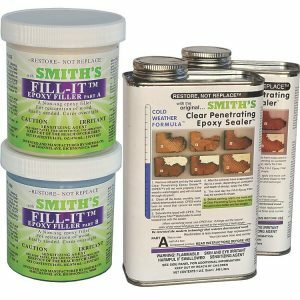 Fill-It Flexible Wood Filler is the perfect partner to Smiths CPES for restoring wood. It is the Epoxy Wood Filler that lasts offering a permanent and watertight solution. Do it once, do it Right. Fill-It epoxy filler represents a breakthrough in the technology of filling compounds. using advanced hydrogen bonding technology, it creates a high strength, light weight, non-sagging, easily sanded epoxy filler. One part is an epoxy resin and the other a curing agent. Both parts are derived from natural wood resins so they are extremely compatible with wood. The two components of Fill-It epoxy flexible wood filler are slightly different colours in order to aid in mixing. The mixed colour is off-white, but may be coloured if required. Mix the two components one to one by volume. Mixed they become a gel that can be smoothed and worked to a feather edge. After one to two hours in moderate weather it begins to harden, and cures overnight. Sand as soon as it does not gum up the paper or after.Carving, drilling, sanding and tapping are easy once cured. Drill pilot holes to secure screws without cracking. Paint or Prime once finished – though we recommend a coat of CPES to promote adhesion of finishes to Fill-It. Its compressive strength is so great that you can restore defects in ferro-cement boat hulls with it. If has sufficient flexibility that it is suitable for wooden beams, windows and sills, doors or other parts of wood buildings as well as wood or fibreglass boat hull repair. Apply Fill-It first by forcefully smearing some against the surface. This ensures good adhesion of Fill-It epoxy filler to a surface. Build up to the desired thickness by applying more permanent epoxy filler. Tool the uncured material smooth and level by placing a clean new piece of clear 4-mil or 6-mil polyethylene sheet over the uncured material. Use a squeegee or other tool to smooth the filler through the plastic. 4mil is 100 microns, or about the thickness of a piece of 80gsm copier paper. In the UK this relates to a decent quality carrier bag – a ‘bag for life’ if you will. Peel the plastic film off once the waterproof epoxy filler has cured fully. In order to ensure adhesion of whatever primer or paint is to be applied next, it is recommended that Fill-It epoxy flexible wood filler be sanded, and then lightly over coated with Smiths CPES, before painting. Fill-It bonds very strongly indeed to surfaces that have been treated with Smiths CPES (Clear Penetrating Epoxy Sealer). Ensure however that the solvents have evaporated fully prior to application. Your nose is normally adequate to determine this. How Much Fill-It do I Need to fill my Rotten Wood? Fill-It does not shrink, so a 355ml tub of Fill It will fill 355 cubic centimetres of void with no wastage. There are approximately 15 cubic centimetres in one cubic inch. In the real world wastage does of course happen, so I would normally reckon filling voids of around 300 cubic centimetres or 20 cubic inches from a small Smiths Fill-It. If you have more ‘hole’ than that, you need the larger Smiths Fill-It, which contains 950ml of product, and will fill around 900 cubic centimetres or 60 cubic inches of void. To calculate how much void you have look at the hole, and imagine it as a regular three dimensional rectangle (parallelepiped). Imagine a parallelepiped where the length, width and height are averages of the dimensions of the irregular hole. Thus, your rotten window frame with a 1″ by 1/2″ by 4″ rotten section requires 4 * 1 * 0.5 = 2 cubic inches of filler, = 30 cubic centimetres (30ml) of Fill-It flexible wood filler to restore it. Smiths Fill-It is a 2 part high quality epoxy resin filler. As such you MUST use two different tools to remove the part A and part B components. Mixing ratios are 1:1 by volume, or 92 parts A to 100 parts B by weight. Mix to within 10% accuracy to ensure best results. Use scales to weigh components if possible. Mixing to 10% accuracy can normally be achieved by eye and volume however. Mix the two-components on a flat surface (a piece of scrap plywood or plastic is ideal) using a paint scraper, stiff-bladed putty knife or other similar tool. Use a smear-scrape-fold motion, scraping clean both the mixing surface and the tools occasionally. Keep mixing until the colour is entirely uniform. For mixing to use under the waterline in boats, please read the more detailed Fill-It mixing instructions here. Mixed properly Fill-It is a permanent and waterproof epoxy filler. 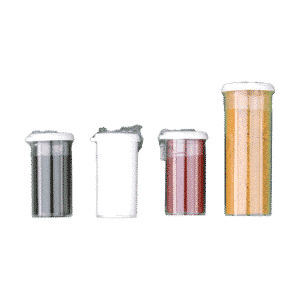 The filler, if uniform in colour, is now ready to use. Unmixed Fill-It lasts pretty much forever. However, if stored in cold conditions (UK winters qualify here), you may notice that the blue part B component has formed crystals. This is not the product going off, but is reversible crystallisation within the very pure contents of part B. Heating reverses the process; we recommend loosening the lid slightly and warming the can by placing it in a saucepan of hot water and leaving it overnight. The crystals will have disappeared by the morning, making the flexible wood filler far easier to mix. You can also use a cool (50 centigrade) oven to good effect. Colour Fill-It using Iron Oxide pigments of paint quality during mixing. We sell a Colouring Kit that can achieve the tones of natural woods, and full instructions for colouring Fill-It can be found here. Unset filler can be removed from tools with many solvents, including our Epoxy Clean Up Solvent, or elbow grease and an old rag. Fill-It is both a powerful adhesive and a permanent filler. You cannot remove set filler from many surfaces. Consequently please clean tools thoroughly before the Fill-It sets hard. We really recommend a coat of CPES over cured Fill-It after sanding to promote paint or varnish adhesion. 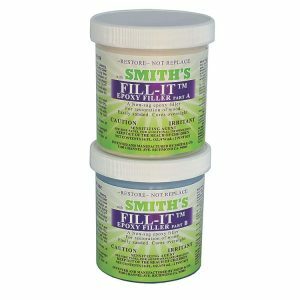 Fill-It and CPES can be purchased together t a discount as a Wood Rot Repair Kit from here. I am no expert in using this type of product but this has been very easy to use. I used the CPES (clear penetrating epoxy sealer) to seal and consolidate the timber then used the two part filler to fill and reconstruct what was severely rotted and damaged wood. I have successfully repaired a 160 year old window frame and newer hardwood frames with this system. It’s easy to sand and paint thus achieving an invisible repair. My hardwood frames that would have cost a fortune to replace have been restored at a fraction of the price. This is by far and away the best wood filler I’ve ever used, and I’ve tried many products over the last 30+ years. It’s easy to mix, gives you plenty of working time, and sands to a perfect finish. I’ve recently used Fill-It to repair splits and minor damage in a 200 year old door frame, and I’m very pleased with the results – an invisible repair that should last forever. Smiths Epoxy Filler. This stuff works! Used on superstructure of my wooden boat. Easy to mix, easy consistancy. And pretty easy to sand to a super smooth finish. Invisible once painted. Seems to be tough as nails. All good. I did not try mixing it with any pigment, though I will be doing so for another project. Again, expensive. But suspect long term will pay off. And Steve is a great vendor, very helpful phone conversations both before and after purchase. Thanks! Does exactly what it says on the pack. this filler is much better that the usual 2 part fillers for wood. Both parts are a softer consistency which makes it easier to get them out of the tub and easier to mix. Excellent to sand when cured. Once painted the repair is invisible.